The Old Foodie: The Pavlova: the story. The Russian ballerina Anna Pavlova was born on this day in 1885, so there is no difficulty guessing our topic today – ‘the pavlova, the sweet dessert’. There has been a longstanding battle between Australia and New Zealand as to who 'invented' the pavlova, with tempers getting quite nasty at times. This is my contribution to the war. For those of you who need the clarification, a pavlova as defined by the OED is “a dessert consisting of a soft-centred meringue base or shell filled with whipped cream and fruit.” I would like it put on notice here that the OED, which should be absolutely non-partisan, has clearly allied itself with the “soft-centred like marshmallow” school of thought, in complete disregard for the very vocal opposition school that maintains a pavlova should be thoroughly dried and crisp throughout. We have established then, that a pavlova is a form of meringue. Neither Australia nor New Zealand invented the meringue, because the meringue was invented before they were. As for meringue, it was not, repeat NOT ‘invented in 1720 by a Swiss pastry-cook called Gasparini, who practised his art in Mehrinyghen [hence ‘meringue’], a small town in the State of Saxe-Coburg-Gotha.’ Even the venerable Larousse perpetrates this myth, in complete disregard for the fact that confections made from sweetened, stiffly-beaten egg whites appear in cookbooks printed well before that date. The earliest I can find appears in the recipe collection of Lady Elinor Fettiplace, which is dated 1604, which she calls White Bisket Bread. To make White Bisket Bread. Take a pound & a half of sugar, & an handful of fine white flower [flour], the whites of twelve eggs, beaten verie finelie, and a little annisseed brused, temper all this together, till it be no thicker than pap, make coffins with paper, and put it into the oven, after the manchet [bread] is drawn. Note: this is clearly what we would call ‘meringue’, but Lady Elinor does not use the name. The first use that I am aware of (and I stand willing to be corrected) is in the cookbook of François Massialot, the first chef of Louis XIV (1638 - 1715). 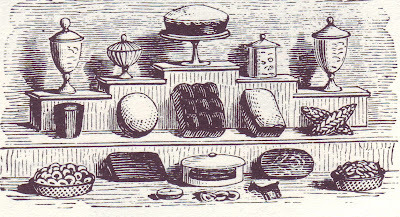 His book was published in 1692, and contained a chapter on “Meringues and Macaroons”. This is one of the recipes from the English translation of 1702. Having caus’d the Whites of four new-laid Eggs to be whipt, as before, till they rise up to a Snow, let four Spoonfuls of very dry Powder-sugar be put into it, and well-temper’d with a Spoon: Then let all be set over a gentle Fire, to be dried a little at two several times, and add some Pistachoes, that are pounded and dried a little in the Stove. Afterwards, they are to be dress’d as other, and bak’d in the Oven somewhat leisurely, with a little Fire underneath, and more on the top; When they are sufficiently done, and very dry, let them be taken out, and cut off with a Knife: Lastly, as soon as they are somewhat cold, let them be laid upon Paper, and set into the Stove to be kept dry. So, should M.Massialot get the credit for ‘inventing’ the meringue, as the evidence is that he used the name first? Or, until an earlier manuscript turns up, should it go to Lady Elinor, on the principle that the concept is the thing, not the name? Australia and New Zealand, we have established, did not invent the bisket-bread/meringue style confection itself. Did either of them actually invent the particular iteration which both now call the pavlova, or did one of them steal the name an apply it to a similar, but quintessentially different variation? Here we have the nub of the dispute. It is all in the name. It is not my job here to take sides (although as I have pointed out elsewhere, NZ is the country that re-named the Chinese Gooseberry the Kiwi Fruit, in what was clearly an attempt to give it origin status), so I hereby give you the known facts/factoids in chronological order for you to make up your own minds. 1926: A cookbook printed in NZ called Cookery for New Zealand, by E. Futter contained a recipe ‘Meringue with Fruit Filling’. It was not, however, called Pavlova. 1927: The OED cites the first use of the word ‘pavlova’ in ‘Davis Dainty Dishes’, published by Davis Gelatine in NZ. It was ‘composed of coloured layers of jelly made in a mould resembling a ballerina's tutu’. Pavlova, as coloured jelly – I don’t think so! 1927: A group of Congregational Church ladies produced a cookbook called Terrace Tested Recipes, in Wellington NZ in 1927. One recipe was for ‘Meringue Cake’, which was made in two tins, the resulting two cakes being sandwiched together with cream and fruit, or serves as two cakes. Not called pavlova. Structure similar? Not the two layer one, certainly. 1929: Yet another NZ cookbook, Mrs. McKay’s Practical Home Cookery, had a recipe for ‘Pavlova Cakes’, the plural representing the three dozen little confections made from the mixture. This is hardly the same thing as a pavlova with the traditional filling/topping, now is it? The recipe was submitted by a Laurina Stevens for the Rangiora Mother’s Union Cookery Book, it was called “Pavlova” - the correct name, the recipe was for one large cake and contained the correct ingredients, egg white, sugar, cornflour, and vinegar, and it had the correct method for cooking. This has been proven thanks to the research of Professor Helen Leach, of the University of Otago’s anthropology department. Prof Leach also uncovered a 1929 pavlova recipe in a New Zealand rural magazine which had the correct ingredients and correct method of cooking, however it was unfortunately published under a pseudonym. 1935: The family of Herbert Sachse of the Hotel Esplanade in Perth, Western Australia have maintained a vigorous claim that he invented the dish to be served at afternoon tea, and commented (or someone did) that “It is as light as Pavlova”, and hence the name Sachse claimed in a magazine interview that he ‘improved’ a recipe for Meringue Cake he found in the Women’s Mirror Magazine on April 2, 1935 (which had been submitted by a NZ resident. I guess the only way this dispute will get resolved is if we can come to a consensus as to what defines a pavlova, as distinct from a meringue or a meringue cake or a pavlova cake(s). I reckon the passionfruit is crucial. We had a story about monkeys and bananas on this day last year. Once in a young lifetime one should be allowed to have as much sweetness as one can possibly want and hold. Judith Olney. great read and research. Pavlova was a family favourite in our British houselhold, our meringue definitely being crispy on the outside and soft, gooey and marshmallowy within. I personally favoured a raspberry/banaa topping on whipped or double cream. My mum liked to use slices of kiwi [or rather chinese gooseberry]. My friend down the street - her mum always used nestle's tinned cream and halved grapes. I completely agree Sam, a pavlova by any other name is still a great idea! I've never eaten a pavlova (crisp OR soft), but this post absolutely rocks, Janet! Good research there Janet. I follow Michael Symons view which is much he same as you said under the 1935 paragraph. Great post, however I'm afraid you have missed a crucial piece of evidence to the New Zealand claim, that of a 1932 recipe published in a Rangiora Mother's Union cookery book. It had the correct name, was for one cake, contained the correct ingredients and correct method for cooking the pavlova. You possibly will enjoy reading my post on the "delicate" subject..
Hi Bron - thanks! It is always good to have a new bit of historic fact, even if the "win" goes to the other side! I have posted an update today, which you can see at http://theoldfoodie.blogspot.com/2007/01/pavlova-story.html. I had a suspicion about these when you first posted it but after seeing a picture of them on Shuna's site eggbeater I know these are what we call 'Schaum Tortes' in northeastern Wisconsin. Hi Paul - great info to add to the story. What does 'Schaum torte' translate as? I shouldn't limit it to just Northeastern Wisconsin. The area was primarily settled by German immigrants. Schaum torte (foam cake) is a German/Austrian dessert. It's a baked meringue usually served with strawberries and whipped cream. Many of the big recipe sites have recipes. I'm not sure how old the recipe my aunt uses to make them is but I think it's pre-1920's.